Chocolate arrives in Sicily at the end of 17th century with the Spaniards and finds its natural habitat in the County of Modica, where the tools and the traditional method to prepare it are soon implemented. Fresh grounded cocoa beans, sugar and spices are mixed together on a lava stone. The fire – warmed up by almond shells - is very delicate so that the low temperature preserves the chocolate's aromatic bouquet, while the sugar maintains its crystalline structure. The result is a dark and grainy tablet, so similar to the heart of a stone. Its roughness makes it a product of gastronomic archeology and has been recently rescued by the Bonajuto family, the leading figures of the Modican chocolate renaissance. Starting from 1820, the Bonajutos are in charge of a cocoa-press machine, conquering the main role in the local production chain. In 1880 Francesco gives up all the family activities – from the snow trade to the sale of pickled citrus fruit – to devote himself to the confectionery business. In 1911, his chocolate his awarded with the gold medal at the International Agricultural Industrial Exhibition in Rome. The world wars and the industrial development in the chocolate sector seem to erase the traditional method of el chocolate a la piedra: a few traces remain in South America, Alicante and other small villages in Spain, while Modica manages only a tiny domestic production. One has to wait until the appearance of Franco Ruta, great-grandson of Francesco Bonajuto and a charismatic personality, to witness its rebirth, thanks steady word-of-mouth powered by journalists, intellectuals and chefs from all over the world. 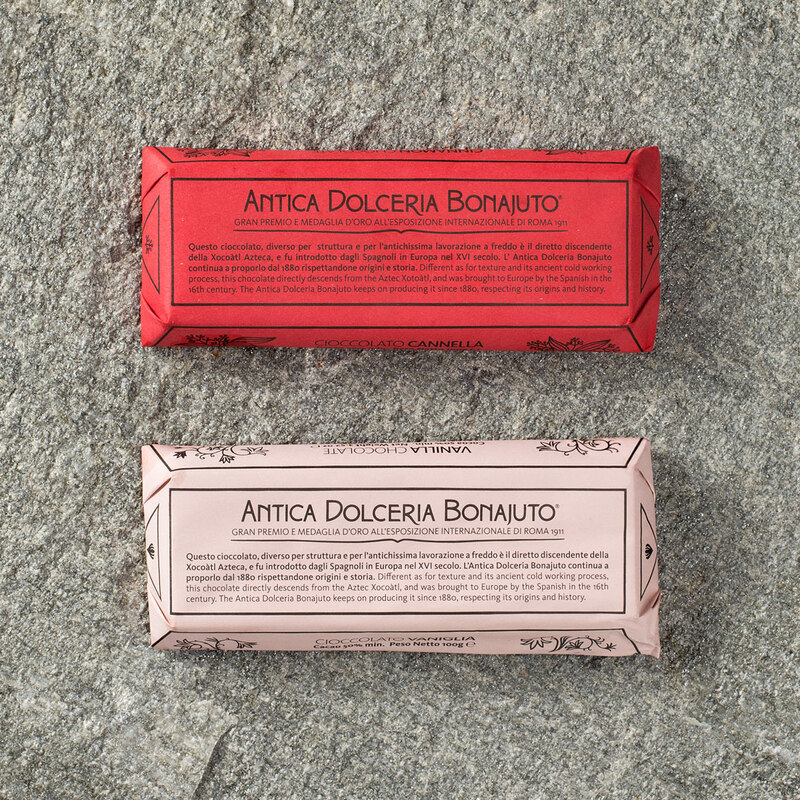 Modica chocolate has since been gaining international fame, while reconnecting the family to its origins. Today, the company, led by Pierpaolo Ruta, produces five hundred thousand pieces a year. With the ambitious desire to help people rediscover the very essence of his territory: because, as he says, "A bar is first and foremost a cultural instrument. It's up to us to fill it with a meaning".